DANEHILL EXPRESS (AUS) (Bay 2001-Stud 2008). 3 wins to 1600m, MRC Tupperware Cup S., L. Sire of 199 rnrs, 97 wnrs, inc. SW Express Service (WATC Magic Millions Perth 3YO Trophy, RL, Properantes, Stagnite, SP North Ridge, Clarify, Lenience, Moonsearch, Dream Lifter, Helder the Painter, Rusty Peaches and of Halo Express, Ain't Bad, Hard to Express, Bayella, The Danehill Rose, Cardup Legend, Bangkok Express, Cougar Express, Matching Motors, etc. The Director (g. by Danehill Express). 2 wins. See below. About Carla. 7 wins. See above. Race Car. Placed at 3 in Aust. Flash Harry (Chanteclair). 5 wins-1 at 2-at 1000m, 1200m, WATC Tooheys Blue H., Lawley H., Mullaloo H., E Brice Vista H., 2d WATC Hocking H., 3d WATC Placid Ark S., L, Retravision H., Marillier H.
Satin Sash (Haulpak). 4 wins-1 at 2-at 1100m, 1400m, 2d WATC Gimcrack S., L, Baden Baden H., 4th WATC Queens P., Gr.3. Flash That Smile. 6 wins at 1000m, 1200m, WATC Honneur H., Banksia H., On Guard H., West Coast Eagles H., 2d WATC Malaysia Airlines Welter H., Advanced Feeds Quality Sprint H., Burabudy H., Emporium H., Broadway H., PKB 850 Vitamix H., 3d WATC Sharks H., Bobby Breen H.
Flash of Satin. 2 wins at 1500m, 1800m, WATC Barcelona H., Liam Bartlett H., 2d WATC Sunspeed Evergreen H., Hare H., 3d WATC Emu Export H., Show Ego H., Pink Batts H., Kat Taylor H., Leake H., Kingsley H.
Just a Flash. 3 wins at 1200m in Malaysia and Singapore, Singapore TC Benchmark 53 H., 2d Singapore TC Royal Bangkok Sports Club Trophy, Class 4 H.-twice, Class 5 H., Benchmark 53 H.-twice, 3d Singapore TC Class 4 H.-twice, Benchmark 53 H.
West Man. 3 wins at 1200m in Malaysia. Satin Flyer. 3 wins to 1200m in Aust. Maybe. 2 wins at 1100m, 1700m in Malaysia. MR CUBE (Esquire). 12 wins to 1200m, A$192,735, VRC Brian Courtney H., L, Manchester Unity H., Roma H., MVRC Diet Coke H., VATC Normanby H., WATC Celerity Sprint H., Jenark H., Colony H., Burswood Hotel H., 2d VRC Brian Courtney H., L, VATC Japan Racing Association P.H., L, 3d WATC HG Bolton Sprint H., L, 4th VATC Rubiton S., Gr.3, SAJC Quit and Win S., L.
Satin Flash. 3 wins. See above. FOR YOUR EYES ONLY (Bletchley Park). 10 wins-4 at 2-from 1000m to 1800m, A$620,275, WATC Gimcrack S., L, Ascot One Thousand Guineas, L, Beaufine S., L, Westspeed 2YO P.-twice, Owner for a Day 2YO P., Kilkenny H., Air & Water Residential H., Magic Millions Perth 3YO Trophy, 3d WATC Lee Steere S., Gr.2, Prince of Wales S., Gr.3, Champion Fillies S., Gr.3, JC Roberts S., L.
Race Record: 15 Starts 2-3-3 A$41,815. 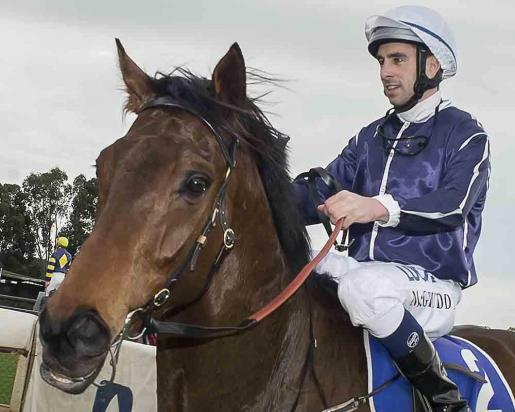 2 wins at 1200m, 1600m in 2014-15, 2d WATC Tabradio on 1206AM H., Perth Racing Become a Member Today H., 3d WATC Tabtouch.com.au H.